When people hear things enough, they tend to start thinking those things are fact. When it pertains to pests in your home, things that you’ve ‘heard’ aren’t necessarily facts. Holistic Pest Solutions wants to help you keep unwanted insects and rodents out of your home, so we’ve broken down a few of the major misconceptions of major household pests. This is the biggest myth on this list. If you think that vermin can’t hide from you, you’re sadly mistaken. Humans have designed our habitats to be hospitable—after all, what animal wouldn’t want to live in a place with food, clean water, and protection from the elements? Pests have evolved to live alongside us and take advantage of this hospitality without being noticed. Unless you check every square inch of your home regularly, you probably have some type of pest living with you. There’s a theory unwanted house-guests are attracted to unclean areas, and while it’s true that many pests may flock to the occasional missed crumb on the floor, they certainly don’t need it to be compelled to enter your home. You can scrub your home until every surface sparkles and the vermin will still come. Your home is warm, has resources for nesting, food, water, and it is protected, for the most part, from threats of weather and predators. There are plenty more reasons than messiness to attract them into your abode. That said, you do need to be aware of potential food sources. Roaches will eat almost any form of organic matter—including hair and fingernail clippings. Protecting your food from pests is harder than you might think. Mice, for example, can jump up to a foot in the air, squeeze through a hole the size of dime, and climb notoriously well. That means you can’t simply place food on a higher shelf or shut it behind a door and call it a day. And the merest scrap of food can go a long way – they typically only eat 3 grams of food a day (that’s only 8 lbs all year). You may have locked up all your food, but it takes a lot of work to rid your home of every crumb—and each crumb makes a meal for a mouse or an insect. Second, if pests can’t get food and water from your kitchen or faucets, they can often find it somewhere else. An animal might set up camp in your home, but venture out to, say, the yard for its meals. Also, apartment dwellers, for example, often share utilities, which make easy highways for pests to travel between units looking for resources. Finally, many types of pests can endure for long periods of time without eating or drinking. Flea eggs can lie dormant for up to a year. Roaches can survive for up to a month without food, and a week without water. 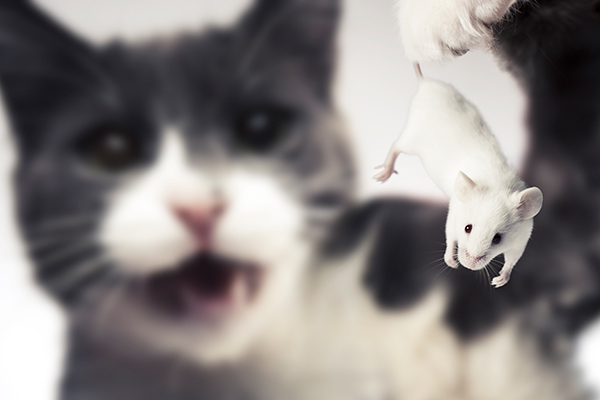 Cats are one of the earliest forms of pest control. Some even hunt the imaginary bugs! But while cats are effective predators, they have a hunting range. Unless your pet has free run of the entire house, from the attic to the basement to the cabinets under your sinks, pests will simply hide where it won’t—or can’t—go. Really bad rodent infestations will defy even the most tenacious mouser, because there’s only so many pests a cat can kill in a day. This is a very common misconception. While it might be true that a home made of brick or stone placed on concrete can be better protected against termites, it is not 100% guaranteed. Typically, all homes have a wooden frame, and many also have wooden siding, decks, and other similar features. No matter how much the wood is separated from direct contact with the soil, the termites can and will work their way to it unless suitably deterred. To make your home unattractive to vermin, your best bet is preventative repairs and cleaning. Maintain your plumbing carefully to prevent even small leaks, which pests can use as a water source. Weather-seal the outside of your home and garage to make it more difficult for tiny intruders to squeeze in. Fill in small spaces where rodents or insects might hide with insulation or other materials (preferably something that doesn’t submit easily to gnawing or chewing). Seal up anything organic that might be eaten—this includes items like shoe polish and trash—in thick plastic or metal containers, and keep these vessels out of the way in cupboards. CONTACT Holistic Pest Solutions if you need a free consultation for a pest problem or treatment any pests; or give us a call at 434 842 1700. Whether you’re in Charlottesville, Palmyra, Keswick, Ivy, Crozet, Earlysville, Greene, Madison, Waynesboro, or Staunton, Holistic Pest Solutions has the perfect plan for you that is as Green As You Wanna Be!